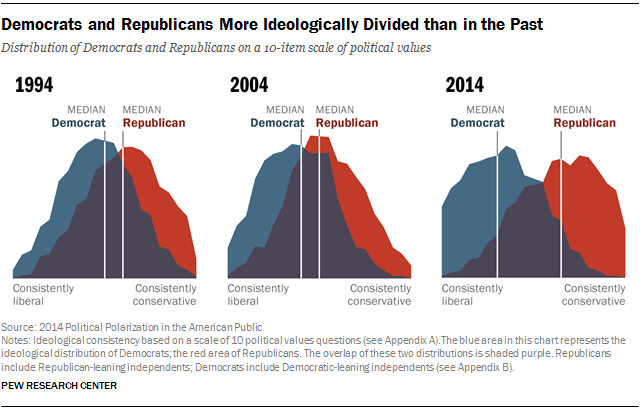 1Republicans and Democrats are more divided along ideological lines – and partisan antipathy is deeper and more extensive – than at any point in the last two decades: 92% of Republicans are to the right of the median Democrat; and, conversely, 94% of Democrats are to the left of the median Republican. 2The earnings gap between young adults with a bachelor’s degree or higher and those without has never been greater in the modern era, despite soaring student debt and high youth unemployment. In 1979, when the first wave of Baby Boomers were the same age that Millennials are today, the typical high school graduate earned about three-quarters (77%) of what a college graduate made. 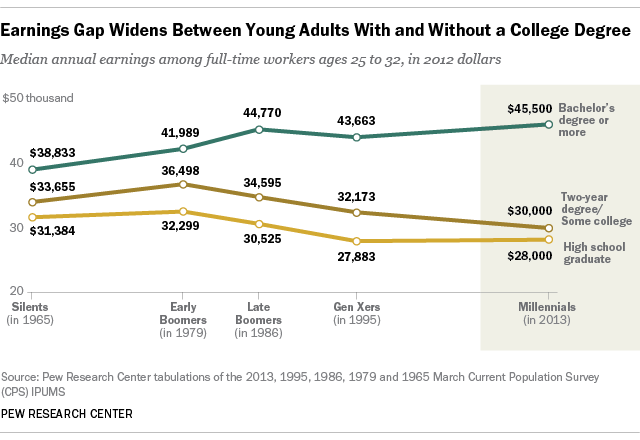 Today, Millennials with only a high school diploma earn 62% of what the typical college graduate earns. 3After decades of declining marriage rates and changes in family structure, the share of American adults who have never been married is at an historic high. 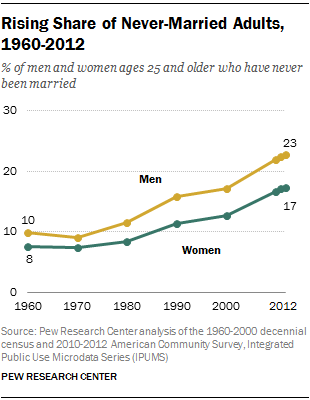 In 2012, one-in-five adults ages 25 and older had never been married. Men are more likely than women to have never been married. And this gender gap has widened since 1960. 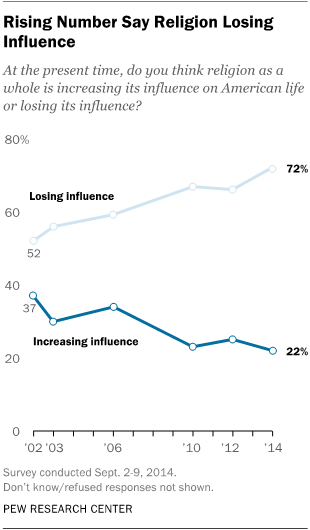 4Nearly three-quarters (72%) of the public thinks religion is losing influence in American life, up from 52% who said so in 2002; and most people who say religion’s influence is waning see this as a bad thing. Perhaps as a consequence, a growing share say religion should play a role in politics. 5The Great Recession was hard on all American families. But even as the economic recovery has begun to mend asset prices, not all households have benefited alike, and wealth inequality has widened along racial and ethnic lines. 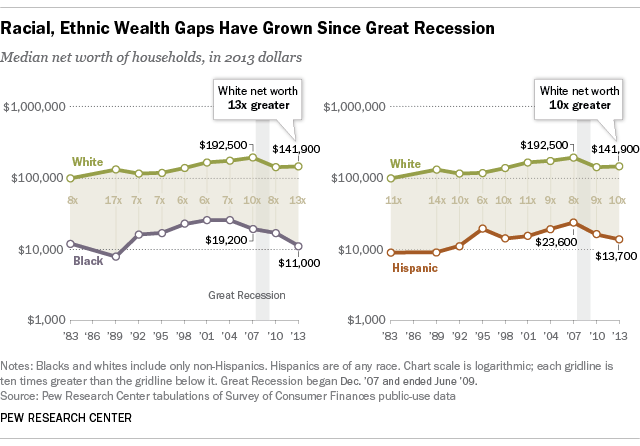 The median wealth of white households was 13 times the wealth of black households and 10 times that of Hispanic households in 2013, compared with eight and nine times the wealth in 2010, respectively. 6Americans are now more attached to their cellphones and internet access than their televisions or landline telephones, marking a shift in their communications habits since 2006. Over half of internet users now say the internet would be “very hard” to give up. And among this devoted group, 61% say the internet is essential to them, either for work or other reasons. Translated to the whole population, 39% of all Americans feel they absolutely need to have internet access. 7While privacy issues continue to pervade public policy debates — after recent hacking incidents and amid the emergence of tech products that use consumer tracking data — 91% of Americans agree or strongly agree that consumers have lost control over how their personal information is collected and used by private companies. 8The American public appears ready for a truce in the long-running war on drugs: 67% say the government should focus more on providing treatment for those who use illegal drugs such as heroin and cocaine, while just 26% think the government’s focus should be on prosecuting drug users. And nearly two-to-one say it is a good thing, not a bad thing, that some states have moved away from mandatory sentences for non-violent drug offenders. 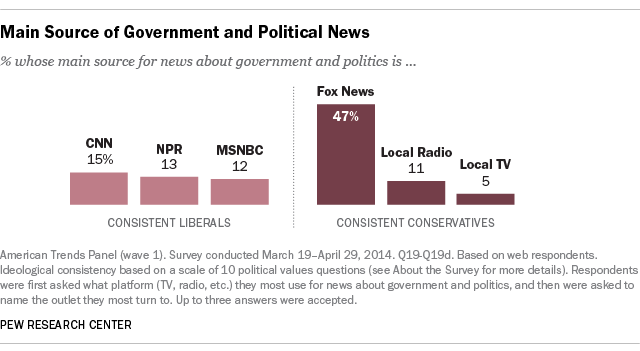 9When it comes to getting news about politics and government, liberals and conservatives inhabit different worlds: Consistent conservatives are tightly clustered around a single news source, with 47% citing Fox News as their main source for news about government and politics, while consistent liberals name a few main news sources. 10Major shifts continue to pressure America’s news businesses, as new organizations struggle to find a profitable model that increasingly depends on digital audiences and new revenue streams. Our State of the Media report found that there are 468 digital news outlets employing nearly 5,000 journalists. 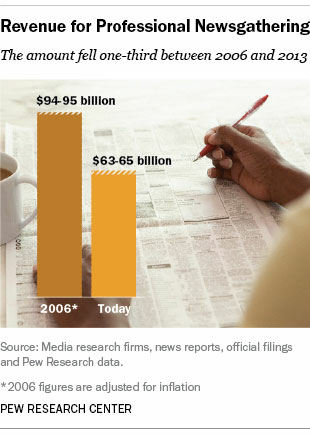 Even so, overall revenue for the news media industry has declined by one-third since 2006. 11Immigration policy debates continue to roil Congress and Washington, with Obama’s recent executive action likely to affect millions of unauthorized immigrants. 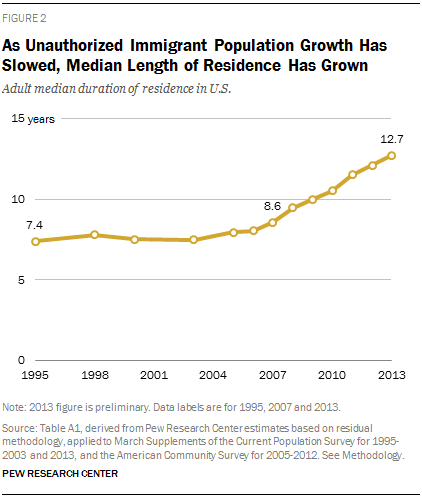 While the population growth of unauthorized immigrants living in the U.S. has stabilized, there’s been a sharp increase in the median length of time they have lived here. The typical unauthorized immigrant adult has now been in the U.S. for nearly 13 years, up from 7.4 years in 1995. 12Economies worldwide are still struggling to recover from the 2008 global financial crisis, and growth overall has been lackluster, especially in Europe. But life is improving in some places more than others. 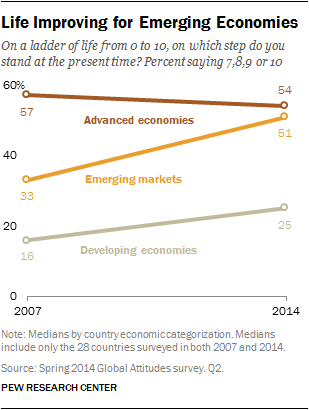 People in emerging markets now rival those in advanced economies in their self-reported well-being: A median of 51% in emerging markets now say they are satisfied with their lives, an increase of 18 points since 2007. 13The world’s aging population, especially in developed nations, has become a focus of concern, for the global economy and policy decisions related to social programs. 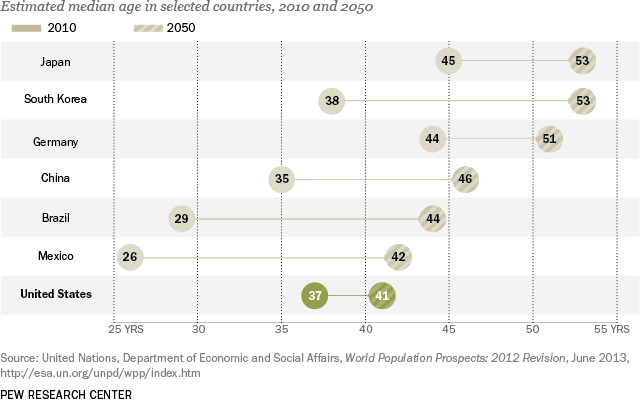 By 2050, the majority of people in Japan, South Korea and Germany are projected to be older than 50. Brazil and Mexico, which now have a younger population than the U.S., will potentially have an older one than the U.S. by the middle of this century. 14Two years ago, Pew Research Center chronicled the rise of Americans who say they don’t have any religious affiliation. This year, we found another big trend in religion: an exodus among Catholics from the church in Latin America, where nearly 40% of the world’s total Catholic population lives. 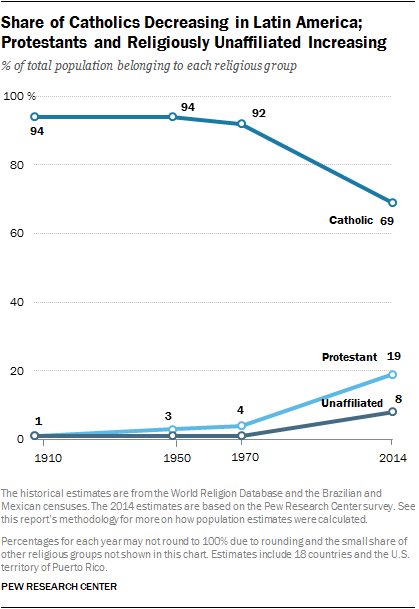 Identification with Catholicism has declined throughout the region, as many Latin Americans have joined evangelical Protestant churches or rejected organized religion altogether.